7 Line up the top edge of C1 with the sewn piece as shown, doing your best to center it. Starting and ending at about 1/4"-1/2” in from each side of C1, sew together with a 1/2" seam. Again, reinforce with a zigzag stitch. Line up C2 with the bottom edge of the A/B piece, and repeat this step. 8 Now sew together all four side corners of your cover by aligning each short side to its adjacent short side, and sewing a ½” seam. Again, reinforce all the seam allowances with a zigzag stitch. Don’t stress too much if the corners bunch a tiny bit; unless you’ve been grossly off in your previous measurements, it’ll look fine. 9 Finally, iron a 1/4" double hem all along the raw bottom edge of your cover (fold edge 1/4" up; then fold another 1/4"). Pin if you feel like the ironed hem isn’t staying put. Now sew the hem with a straight stitch. Turn your cover right side out, gently tugging and poking at the corners as necessary to get them to straighten out as much as you can. Slide the cover over your box, pulling the tissue through the opening. 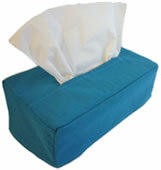 And voila -- no more ugly tissue box!